In this engaging and thought-provoking presentation, Edgar shares his philosophy that “without conflict, we have no need for leaders”. 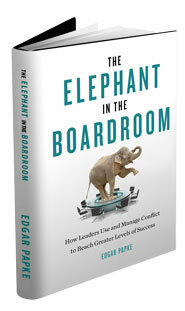 Based on his book The Elephant In The Boardroom, he provides powerful insights into the expectations we have of leaders and the links between leadership, conflict, and the pursuit of innovation. Based on his over 25 years of working with and coaching leaders, he explores the unique relationship leaders have with conflict and why they all too often avoid conflict and unintentionally contribute to the lack of accountability and dysfunction that follows. Attendees are invited to explore the pursuit of self-knowledge and the advantages that come with understanding one’s personal story, behavior, and the ultimate power of choice. In a presentation that delivers extraordinary benefit on both a personal and professional level, Edgar provides a powerful approach to managing conflict with intention that will leave you thinking differently about your relationship to conflict and more courageously use it to achieve greater levels of success in your life. How leveraging conflict results in higher levels of creativity, innovation and greater levels of performance in business and life.